A Moroccan court jailed a leading newspaper chief for a year on Thursday after finding him guilty of publishing misleading information. 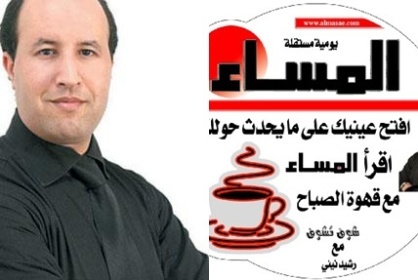 Rachid Niny, director of the Al Massae daily, was tried for “disinformation” after writing articles criticising the Moroccan intelligence agency and calling for the body to be put under parliamentary control. Lawyers for Niny slammed the outcome and said they will appeal. “We reject this verdict, which is an attack on free expression,” said Khalid Sefiani. “We regret that the court dismissed the application of the press code in favour of a penal one. The verdict was met by howls of protest from Niny’s supporters. The court dropped part of the prosecutor’s charge which asked that Niny be banned from journalism however. Al Massae has a daily syndication of about 113,400 and is one of Morocco’s biggest newspapers. Niny was accused of “criticising court decisions” and condemning crimes “that did not take place,” according to the charge sheet. Reporters Without Borders called for the authorities to release the news chief following his arrest.